Cor Blimey, It’s a Japanese Ghost! HIGH When the doll puzzle added item interaction to the game. LOW Spending ten minutes looking for a key because it wasn’t clear that I’d completed a puzzle. WTF Okay, I’m ready for the big finale! Or… the credits, I guess? 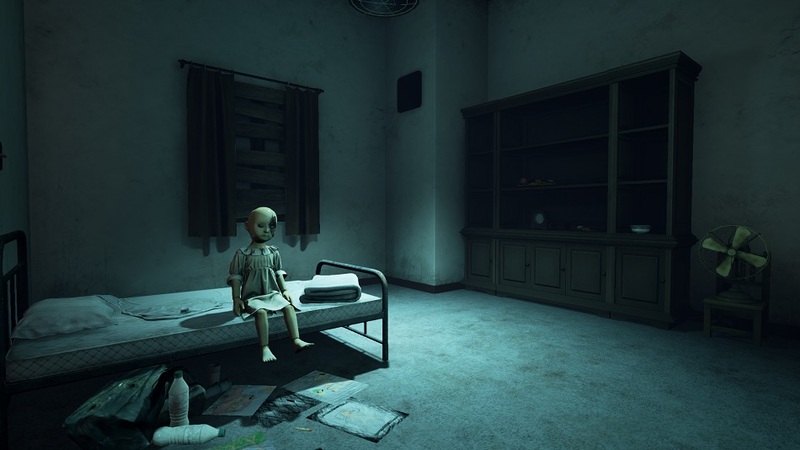 When it comes to VR titles, Weeping Doll is as lightweight as they come. An interactive horror story that can’t really be called a puzzle game since it only has three puzzles, Weeping Doll puts players in the role of a newly-hired maid working in a Japanese mansion who finds herself with the unenviable task of uncovering her employer’s dark history — not that it takes much figuring out since things begin with a narrator laying out most of the game’s plot and robbing the game of its ability to surprise. Once things begin, the player teleports from room to room while seeing little bits of the backstory, digging up a series of keys, and reaching an ending so anticlimactic that I wasn’t sure it was over until the PSN Trophy popped. Weepnig Doll‘s VR aspects are a mixed bag. Rather than letting the player move around the house freely or just teleport to specific areas of interest, the developers have chosen a middle ground that lets the player use the left thumbstick to move a wireframe model of their character to any point in the room before pressing a button to warp to the location. It’s jarring, to say the least. Environmental interaction is performed by looking at an item or area and pressing a button on the controller. It works, but it’s not exactly engrossing. There are technical issues here — while most of the world looks just fine, the developers used low-resolution images for many of the in-game objects that need to be interacted with, which can lead to the unenviable condition of having a blurry item just a few inches away from the player’s face. It’s a recipe for headaches. The inventory screen also has a bad habit of clipping through walls and furniture, which isn’t an experience I ever expected to have. To its credit, the story, while not exactly groundbreaking, is well-told, and the game manages a few eerie moments without relying on jump-scares. It isn’t well-served by the overwrought voice-acting, which is all in heavy British accents despite the game being set in Japan. The puzzles, when the game bothers to have them, are well-thought-out and naturalistic enough to make me wish there were more. It also contains the creepiest song I’ve heard in a long while. Disclosures: This game is developed by TianShe Media and published by Oasis Designs Limited. It is currently available on PSVR. This copy of the game was obtained via publisher and reviewed on the PSVR. Approximately 1 hour of play was devoted to the single-player mode, and the game was completed. There are no multiplayer modes. Parents: According to the ESRB, this game is rated T and contains violent references. All of the violence is in backstory, but it’s all aimed at an innocent child, so sensitive younger teens may find this a little difficult to take. Deaf & Hard of Hearing Gamers: There are no audio cues of note. There are also no subtitles, so you’ll be missing the entirety of the plot. Not recommended.